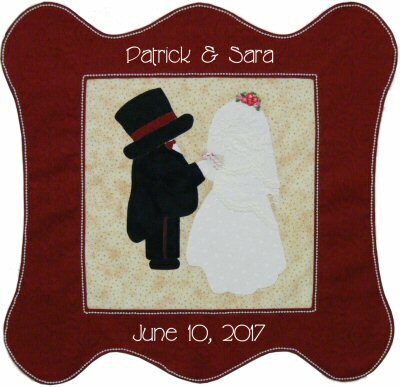 Quilt Size: 19" x 18"
A sweet keepsake wallhanging quilt for any Wedding or Anniversary, to be treasured for years! Full alphabet and hanging instructions included. You will need ¾ yard of fabric for the frame (matching the wedding colours would make a nice detail), backing fabric & cotton batting. A fat quarter for the background & smaller pieces for the wedding clothing.